KANSAS CITY, Kan. — While downtown Kansas City, Kansas' plans for a new grocery store are moving along , those in KCK's historic northeast neighborhoods say they need the same thing. Residents have been saying they need a grocery store for a long time. 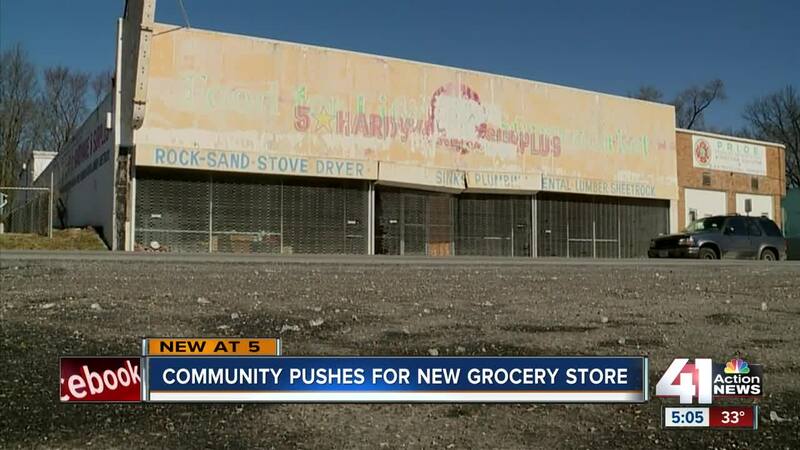 A new initiative focused in recognizing history and culture could bring in a grocery store at 1726 Quindaro. "I've watched a lot of things change, watched a lot of things come and go," Vic James said. James cuts hair at B's Barber Shop near 17th & Quindaro. He lives right around the corner. There is not much along the strip but gas stations and closed down shops. Few businesses, like B's Barber Shop, are open. "I would really enjoy seeing this community come back and be a thriving community once again," James said. "I believe a grocery store is the cornerstone of development," Joshua Hatchett, one of the supporters behind the push, said. "We want to revitalize the Northeast area and build it up,"
The Historic Northeast Midtown Association is working with partners to turn the old building at 1726 Quindaro into a grocery store, which sits right across from B's Barber Shop. James says he remembers the building was used for many different businesses over the years. It was a hardware and surplus store, grocery store, thrift store and party hall. The project is in the planning phases and capital costs are around $250,000. HNMA is exploring a co-op model, which is essentially a grocery store owned by the people who shop there. Customers can buy in with a membership, but anyone can shop there. "To have this grocery store and to see the effort that's going into it, it'll start to build up that sense of 'yes we can do this and let's do it again,'" HNMA's Rachel Jefferson said. Jefferson says the project is about reinvesting in a neighborhood that has long held negative stereotypes and was subject to discriminatory practices, like redlining. "The community down here used to thrive, it used to be supported," Hatchett said. Hatchett, James and others who have grown up off Quindaro will tell you about "back in the day." Black-owned businesses were up and down the strip. "All of that stuff is gone, and it was never really replaced by anything," James said. "It was like the area was being deadened out." Community meetings on the project are scheduled from noon to 2 p.m. and from 2 to 4 p.m. on Saturday, Feb. 15 at 1726 Quindaro. "They want diversity of products. They don't want to be kind of pigeonholed into one particular type of product. They want to have the same thing and same opportunities and same access that everybody else has," Jefferson said.